There will be knitting news tomorrow. But today I'm talking movies. I've had a chance to see several movies in the last few days. I saw Bette Davis, both young and old but always named Charlotte, in Now, Voyager and Hush...Hush, Sweet Charlotte. Now, Voyager left me feeling very disappointed in the end. The culmination of a story about a woman finding her independence ending with her having some freaky surrogate relationship with the daughter of the man she loves left me a little disgusted. Yes, it was a different time but creepy is creepy. And speaking of creepy, Hush, Hush, Sweet Charlotte is one crazy creepy film. At first I thought it was just campy. Davis plays an aged southern belle who is widely believed to have hacked her married lover to death with a cleaver forty years earlier. The film unravels into a deeply disturbing, though campy, psychological thriller. One thing you can say for Bette Davis. The girl could knit. 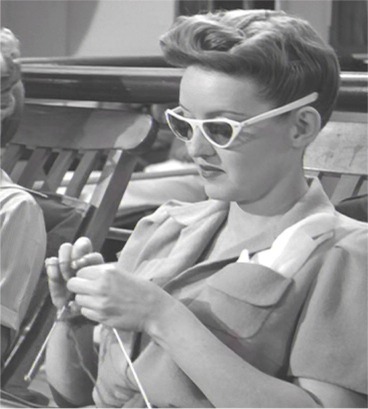 That was no fake movie knitting going on. Her fingers were flying. Wes and I also got to finally see The Departed. Things went much better than last time. I was amazed how wrapped up I got in it given that I knew how it ends. I saw the original, Infernal Affairs, a while ago. Infernal Affairs works well because it's a very sleek, tight movie. There's nothing extra there. The action moves quickly pulling you into the twists and turns. Scorsese's version is vastly expanded and it add lots of emotional weight to the story that is missing in the original. The performances are all great. I particularly enjoyed Alec Baldwin as a sweaty, manic detective. Then this evening Wes and I saw Children of Men. By far the most visceral film going experience you will have all year. This film rips your guts out. It's dark; it's grimy; it's deeply moving. I started to cry over dinner discussing it with Wes. The Traveler's Stockings are in the home stretch. More tomorrow.